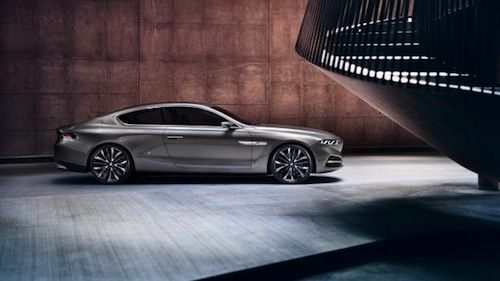 BMW has released a new video of the BMW Pininfarina Gran Lusso Coupe and reveals more of this striking beauty. Check out the video we just added below. Last week we showed you a teaser image of the BMW Pininfarina Gran Lusso Coupe. BMW has unveiled the new one-off coupe and we can see that it's a design that will likely be the forerunner of new things to come from BMW. The elegant coupe makes its global debut at the 2013 Concorso d’Elegance Villa d’Este in Como, Italy today. BMW Group and Pininfarina have joined forces to bring cutting-edge technology, style, dynamics and aesthetics together in one exclusive package. BMW says the two companies worked in close consultation to create a new automotive persona that highlights both design teams ideas about what the high-end luxury class should look like in the future. This new concept coupe is a one-off creation, but it may be giving us a glimpse of future BMW designs that will add a new design language to the BMW claim of elegance and exclusivity. BMW is looking for the competitive edge that will help separate them for rivals Audi and Mercedes-Benz. Karim Habib, Head of BMW Design says, “In Pininfarina we have found the ideal partner to lend shape to this vehicle concept.” The luxury coupe features the typical BMW proportions with a long wheelbase, stretched hood and set-back greenhouse. But Pininfarina definitely had a big influence on the Gran Lusso Coupe. BMW and Pininfarina chose only the finest materials and included top-quality craftsmanship. BMW says the interior features kauri wood that has been aged for 48,000 years that lends a special aura to the cabin. Kauri wood is native to New Zealand and is among the rarest timbers in the world. Its unique grain shifts in color from gold to red to brown, depending on the incidence of light and angle of view. The toppled kauri trees have been preserved in swamps for millennia and is the reason for its special characteristics. The new BMW Pininfarina Gran Lusso Coupe is making its global debut in at the 2013 Concorso d’Elegance Villa d’Este in Como, Italy. The one-off exclusive and luxurious coupe will be powered by a V12 powerplant that makes it a powerful luxury sports coupe. Look for some exciting new designs and power from BMW in the future. Watch the BMW Gran Lusso Coupé concept 2013 interior exterior video.